This unusual salvia comes from Brazil. 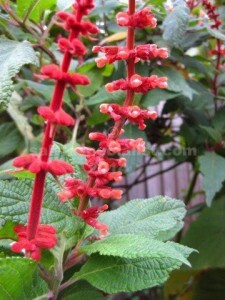 As is often the case with salvias, the calyx is a similar colour to the flower, in this case, a reddish orange. The flowers are narrow and look knobbly at first glance. This plant is not known for drought hardiness, so average garden watering will be needed. It also dislikes frost. It is an upright caney shrub which could reach 2m probably best in sun but a little shade would no doubt be okay. The thickest old stems could be cut to the base once a year or so. It can be multiplied by cuttings. Maybe the nearest salvia in growth habit and colour flower is adenophora.